Changing seasons and holidays come along whether we’re ready or not. It didn’t matter that I have a nasty cold, that traffic was sure to be brutal, or that Autumn isn’t even old enough to participate in the preparation of a Jack-o’-lantern. It was the last weekend before Halloween and Matt insisted we were going pumpkin patching at Half Moon Bay. I am so glad he did. 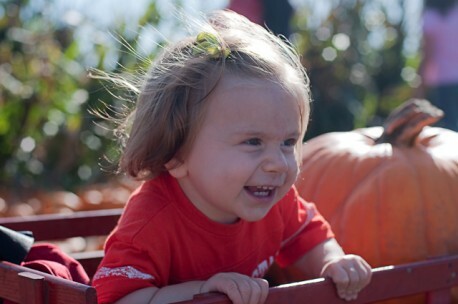 We pulled into Farmer John’s Pumpkin Patch, grabbed a wagon, and started hunting. For those we haven’t seen in awhile, Autumn has three words these days: Dada, Mama, and BALL! Where Matt and I saw pumpkins, Autumn saw bright orange balls everywhere for the taking. She trotted all over the place calling out “Ba-Boll, Ba-Boll”! And though I doubted it would work, she seemed to really enjoy being pulled around the patch in a wagon by her dad. It didn’t take long though until she decided sitting didn’t present enough of a challenge. When she tried to stand we pulled her out and she was ready to help Dad push our treasures to the car. We came away with one gigantic pumpkin we plan to carve tomorrow morning and two pint sized “pumpkinitos” hand selected by our little girl. But the best part was a simple day together and seeing Dad and daughter having a blast. Here’s to new family traditions.